You can’t see the road ahead if you’re too focused on the rearview mirror. When it comes to learning from competitor research, many businesses adopt a “keep your eyes on your own paper” mentality. Yet, we all know we can’t exist (or thrive) in an echo chamber. There are many valuable lessons your competitors can teach you. It’s not about letting competition derail your focus or dictate your company direction. One-upmanship is a surefire recipe for disaster and it’s a far better strategy to focus on what you do best. But if you aren’t popping your head up every so often to look around, you might miss out on valuable insights and lessons from the competition. 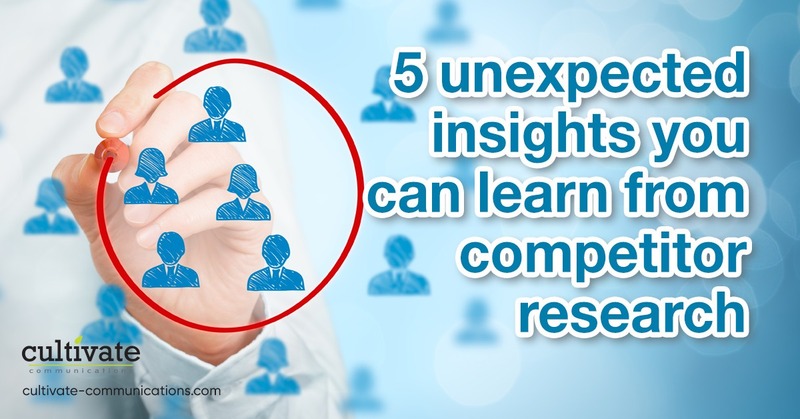 Here are five surprising insights you can learn from competitor research. At the end of the day, success is always, ALWAYS about who can serve the customers’ needs the best. The first lesson comes from looking at your own customers. Why did they choose you above the competition? If you can’t pinpoint the reason organically, don’t be afraid to ask! One-question micro surveys are becoming more and more common. They don’t feel intrusive but give great insight into your customers’ mindset. Look at the customer experience your competition is offering as well—both online and offline. How are their customer reviews? What are they doing to walk their customers through the sales pipeline, wow them, and keep them coming back for more? Don’t mimic your competition but learn from them and discover what about their customer experience is working (and what you could do better). If your competition is big, your small company offers personalized experience. If your competition is innovative and trendy, you’re classic and reliable. Look at your competition and discover what’s unique about your company. How do you differ from your peers and how can you turn those differences into strengths? Check out customer reviews and feedback. Look at their hiring practices and team positions they’re working to fill. Create a SWOT analysis to assess your own Strengths, Weaknesses, Opportunities and Threats. Don’t one-up the competition or attempt to outdo them at what they do well. Focus on your unique strengths and bypass them instead. It’s always easier to forge a different path than attempting to outrun someone on the same trail. Create a gap analysis of your company’s performance and where you would like to be. Then look at your competitors and the market and do the same. Where are the customers who aren’t being served by you OR your competitors? What customer needs aren’t being met? Can you target this segment? How do you find out the market gaps? Listen to your competition and learn from competitor research. When you attend an industry event, visit their booth. Listen to their presentation. Talk to your shared suppliers. In which areas do you overlap and which areas leave a big hole? Start finding ways to fill that niche. Your competitors can show you what you need to do to boost your web presence. Look at their social media posts. Visit their website. Search for them regularly. Pay attention to the online activities they do well and again, draw ideas from the gaps in their web presence. Competitor search rankings (SERP) and analytics on keyword use can give you a huge insight into your competition’s online persona. If you share a common target audience, look at what’s clicking (and getting clicks). Do your competitors regularly update their blog? Does their team share informative video tutorials on social media? Are the CEO’s insightful posts the hot-tip on LinkedIn? Learn what’s working for them and then do your own unique version. It’s easy to learn from what your competition is doing right, but there are plenty of valuable lessons to extract from competition when situations go wrong. Typically, when one industry member runs into trouble, it’s a signal for their peers to start putting their ducks in a row. Fast growing startups looked at Uber’s missteps last year, and quickly tightened up their best practices. Keep an eye on the press and buzz for your entire industry and your competition. Set up a Google Alert for news about your company, and also set one Google Alert up for each of your peers so you’re the first to know. When you see a horror story, use it as a cautionary tale. Don’t simply think, “thank goodness it’s not us,” but ensure there’s no way it could become you in the future. You can learn some very valuable lessons from looking at your competition. Keep your eyes on the horizon but take off your blinders so you can see the 360-degree view. Don’t seek to compete with your peers. Instead, learn from them so you become even stronger.